US food delivery app Uber Eats said Wednesday that it has signed a partnership with South Korean food service company CJ Foodville in the latest move to boost its presence in the country's growing food delivery market. Eight out of 10 South Koreans use smartphones, and they increasingly order popular food items through mobile apps. "We are excited about our partnership with CJ Foodville, the national representative food service brand, bringing its diverse selection to our customers," Jean-Marc Serayssol, head of Asia Sales at Uber Eats, said of the deal signed last Tuesday. "With this partnership, Uber Eats customers can now order CJ Foodville brands at the simple tap of a button, and Uber Eats will continue to expand to provide our services anytime, anywhere." The food franchise unit of South Korean food and entertainment conglomerate CJ Group has about 1,500 franchises across South Korea and nearly 400 franchise stores in seven countries, including the United States, China and Vietnam. CJ Foodville is planning to reinforce the collaboration with Uber Eats overseas. 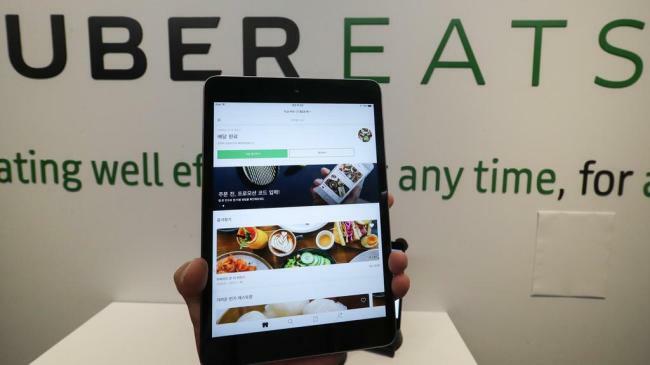 Uber Eats, a food delivery service app run by ride-sharing pioneer Uber Technologies Inc., began its business in South Korea in August last year and currently has more than 1,500 local restaurant partners in Seoul. Uber Eats did not disclose its share in South Korea's estimated 12 trillion-won ($10.7 billion) food delivery app market dominated by homegrown apps, such as YoGiYo and Baedal Minjok.